For your donation of just $5.07 we can produce and deliver a MoonCatcher pad kit to a girl, helping to ensure that she stays in school. We welcome your financial support in any amount. The MoonCatcher Project is a 501[c] nonprofit organization incorporated under the laws of New York State. Want to do more? Set up a FaceBook Fundraiser for The MoonCatcher Project. It’s easy! Just look for “Fundraisers” on the left hand side of your newsfeed page and follow the directions. 100% of your donation will be sent to us and will help to keep girls in school. Shopping at Amazon? Use this link for AmazonSmile, which will donate to our project with each of your purchases. Even if you can't sew, you can participate in and enjoy a MoonCatcher Sewing Bee (also known as a MoonBee.) Come help us make our MoonCatcher menstrual kits. There are useful jobs for everyone, skilled or unskilled. Check our calendar for upcoming Sewing Bees in your area! Do you have extra sewing supplies, including Tyvek envelopes, thread, or fabric, that you’d like to give to our cause? Let us know and we’ll coordinate to make sure your extras are put to use. Our mailing address is PO Box 9443 Schenectady, NY 12309. Reach out to our founder Ellie to inquire about hosting a MoonBee in your community. We've hosted MoonBees in many locations: here is our full list. Click here for Frequently Asked Questions About Hosting a MoonBee. 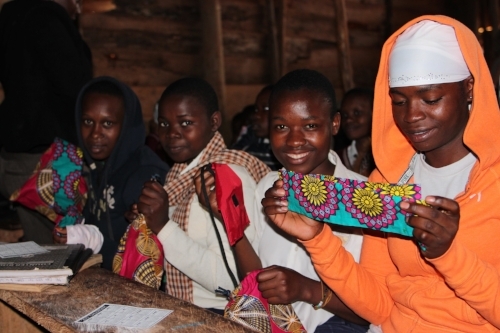 These instructions show you step by step photos to make our menstrual kits from home. Here are the written instructions to make MoonCatcher Kits from home. Click here for video instructions on how to make MoonCatcher Kits. Click here to learn how to use the turner. Need help using the turner? Click here. Keep up to date on the latest news with The MoonCatcher Project by following us on Facebook, Instagram, Twitter and sign up to receive our newsletter.